Its also called “Palak Kofta Kadhi” in hindi. Kadhi is basically a spicy yogurt sauce with chickpea fritters in it. The sauce is thickened by adding chickpea flour. Loads of turmeric are added to give it the perfect yellow color. My husband loves yogurt based curries. And that is why kadhi is a regular item on our sunday lunch menus. But, no matter how many times I make it, I am never consistent in the texture and taste for kadhi which comes out of my kitchen. Sometimes its thick, sometimes its thin, some days its sour and somedays it just turns out bland. I was bored of making the regular kadhi with chickpea flour fritters. So, thought of trying something new with the leftover baby spinach in my refrigerator. I had doubts initially that spinach dumplings wont be soft and wont go with the yogurt gravy. And oh boy, I was so wrong. Kadhi turned out so good. The perfect gooey spinach dumplings melted in mouth instantly. And sauce was neither thick nor thin, it was just perfect. And then I decided that I should note down this recipe so that next time I cook kadhi, it should turn out perfect like this time! Mix all the ingredients for dumplings except oil. It should result in a soft dough. Add more gram flour if spinach does not co-operate. Divide the dough in 7-8 equal portions, and shape into round balls. Heat oil in a wok and deep fry the dumplings until golden brown from outside. In a large bowl, add gram flour and to it add curd slowly. Make sure no lumps remain. Add salt and turmeric to the mixture and keep aside. In a wok, add oil and turn on the heat on medium high. Add cumin seeds and when they crackle, add curry leaves. Stir for 30s and then add onions. Saute the onions on medium flame for 10 minutes until they become translucent. Add red chili powder and stir for a few seconds. Add curd and gram flour mixture and water to the wok and keep stirring continuously until it comes to a boil. 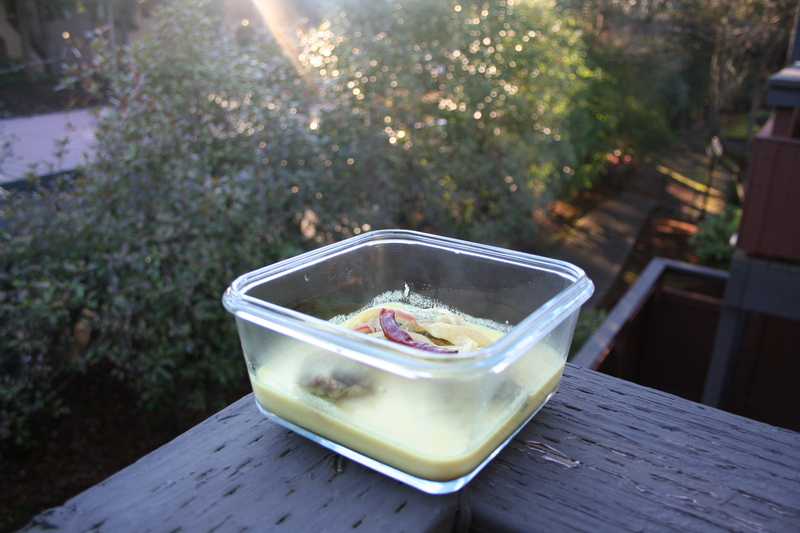 Now reduce the heat to and let the kadhi simmer for 20 minutes. Keep stirring on regular intervals. Add the dumplings and again simmer for 10 minutes. For garnishing, heat ghee in a small pan and add the red chili powder. When it starts sizzling, turn off the heat. 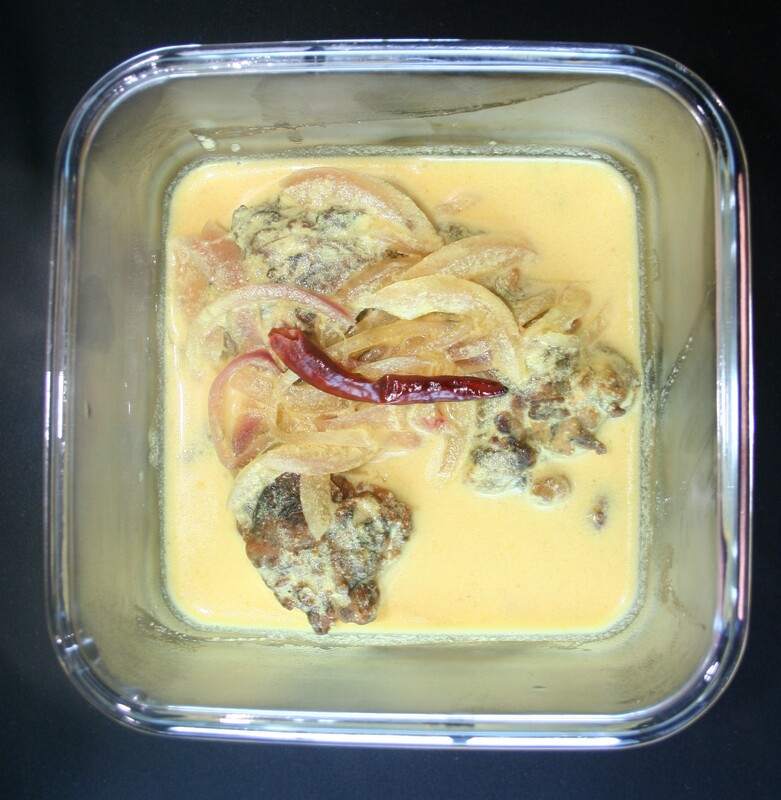 Pour the red ghee over kadhi and serve hot with plain rice.